Open-heart surgery is a major surgical procedure that requires intensive patient monitoring. Clinicians require prompt laboratory test results to assist them in this monitoring. Timeliness of result delivery is of great importance in taking prompt clinical decisions. We set out to evaluate the performance of the support laboratory before and after domiciliation at the cardiac centre using turnaround time (TAT) of electrolytes and liver function tests as benchmarks. This hospital-based descriptive study was carried out at the University of Nigeria Teaching Hospital (UNTH), Enugu. The authors conducted a desk review of laboratory records for electrolytes and liver function tests from March 2013 to July 2017. Relevant laboratory personnel were also interviewed to ascertain types of equipment used and possible causes of delay at different stages of transition during the period under review. The TAT was calculated as the time from sample reception to time of dispatch of results. Between 2013 and 2014, TAT for electrolytes and liver function tests were ~2 and ~6 hours, respectively. In 2015, TAT reduced to ~1 hour for electrolytes and ~1½ hours for liver function tests. Between 2016 and July 2017, TAT further reduced to ~10 minutes for electrolytes and ~30 minutes for liver function tests. In conclusion, we were able to demonstrate improvement in performance of the support laboratory as shown by a reduction in TAT following the transition from the main laboratory to being domiciled in the cardiac centre. Open-heart surgery is gradually gaining recognition in Nigeria following the first open-heart surgery carried out at the University of Nigeria Teaching Hospital (UNTH), Enugu in 1974.1 For a long time, UNTH remained the only centre in Nigeria carrying out open-heart surgery.2 However, more patients requiring these surgeries are now being operated on with the emergence of new cardiac centres.3 Open-heart surgery is a major surgical procedure that requires intensive monitoring pre-operatively, intra-operatively and postoperatively. It, thus, requires team work with various professionals. Laboratory personnel form an essential arm of this team and work to regularly carry out laboratory investigations required to monitor open-heart surgery patients. Despite the importance of these laboratory personnel, there is a dearth of data on the activities of the open-heart surgery support laboratories in cardiac centres. Being a critical and major surgery, the results of related investigations need to be provided with accuracy and timeliness, so that treatment decisions and actions can be promptly taken to improve patients’ outcome. Timeliness, which is expressed as the turnaround time (TAT), is a basic clinician expectation, and often used as a key performance indicator of laboratory performance.4 Thus, improvement in TAT is an attribute that a laboratory aspires to achieve in order to meet the expectations of the laboratory users. In addition to clinician and patient dissatisfaction, delayed TAT also increases the frequency of duplicate samples sent to the laboratory.5 This further increases the workload of the laboratory, and invariably increases hospital costs incurred by patients. The total testing process has traditionally been divided into pre-analytical, analytical and post-analytical phases.6 Each of these phases may contribute to delays in TAT. Pre-analytical factors include delays in transporting samples to the laboratory, delays involved in receipt, recording and assigning laboratory numbers to patient samples and delays involved in processing of samples. Analytical delays include problems with equipment downtime, manual methods of analysis, need to perform a calculation, unavailability of testing personnel, and reagent stock outs, among others, while post-analytical factors include delays in result recording and delays associated with manual dispatch of results. The authors’ objective was to determine the performance of the support laboratory before and after domiciliation at the cardiac centre using TAT of electrolytes and liver function tests as benchmarks. This hospital-based descriptive study was carried out by the authors at UNTH Enugu. UNTH Enugu is a 576-bedded tertiary hospital located in the Southeast of Nigeria. It is one of the foremost teaching hospitals in Nigeria and the National Cardiothoracic Centre for Excellence. The hospital has a main laboratory comprising four departments: chemical pathology, haematology, microbiology and morbid anatomy. In this study, the authors conducted a desk review of laboratory records for electrolytes and liver function tests from March 2013 to July 2017. Relevant laboratory personnel involved in open-heart surgery were also interviewed to ascertain types of equipment used and possible causes of delay at different stages of transition during the period under review. Laboratory tests carried out intra-operatively included electrolytes, blood gases, glucose, lactate, activated clotting time, urea and creatinine. Pre- and post-operatively, liver function tests, prothrombin time (PT)/international normalised ratio (INR) and full blood count are included. In this study, electrolytes were chosen as a representative of the panel of tests done intra-operatively, while liver function tests were chosen to represent those done pre- and post-operatively. 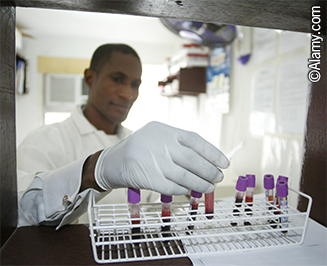 Between 2013 and 2014, laboratory support services were done in the hospital’s main laboratories. The use of manual analytical methods utilising wet chemistry, transport from the cardiac centre to the main laboratory and having to carry out routine tests simultaneously, all resulted in staff fatigue and prolonged TAT. TAT for electrolytes and liver function tests were ~2 and 6 hours, respectively. In 2015, Ion Selective Electrode (ISE 6000) and Roche Reflotron Plus analysers were acquired, located in the main laboratories and used for both routine services and open-heart surgery. The use of these devices reduced the TAT to ~1 hour for electrolytes and 1.5 hours for liver function tests. The samples still needed to be manually transported from the cardiac centre to the main laboratory, and processed before analysis. In 2016, Abbot I-STAT handheld analysers were acquired, and, in 2017, Roche Reflotron Plus analyser was acquired. Both were exclusively used for open-heart surgery and domiciled in the cardiac centre. This further reduced TAT to ~10 minutes for electrolytes and ~30 minutes for liver function tests for tests done in the cardiac centre, while TAT remained unchanged for tests done in the routine laboratory (table 1). Between 2013 and 2015, support laboratory services were done in the hospital main laboratory. This period is described by the authors as ‘pre-domiciliation’, while the period 2016–2017 witnessed support laboratory services within the cardiac centre and is described as ‘domiciliation period’. The pre-domiciliation period occurred in two phases: phase I (2013–2014) and phase II (2015). Phase I was characterised by the use of manual methods of analysis utilising wet chemistry. Phase II witnessed the use of Ion Selective Electrode (ISE 6000) and Roche Reflotron Plus. Both devices used non-manual methods of analysis. A common feature of both phases is prolonged TAT, but more in phase I. The prolonged TATs recorded in phase I were attributed to pre-analytical, analytical and post-analytical factors. Pre-analytical factors included manual transportation of specimens from the cardiac centre to the main laboratory using a third party; delays associated with sample reception, recording, assigning of laboratory number to specimen; and sample processing. The use of manual methods of analysis was the major analytical factor contributing to delay. Post-analytically, recording of the results and time lag in dispatch of results from the laboratory to the cardiac centre were the main implicated factors. In addition, laboratory staff had to combine routine services with urgent test requests coming from the cardiac centre (multi-tasking) and this resulted in increased workload and staff fatigue, leading to delays. The equipment acquired in phase II eliminated the use of manual analytical methods and relatively improved TAT from ~2 hours to ~1 hour for electrolytes and ~6 hours to ~1.5 hours for liver function tests. Other TAT prolonging factors were still inherent as a result of its location in the main laboratory, need for sample processing and its use for other routine services. The domiciliation period (2016 and 2017) witnessed the setting up of a support laboratory within the cardiac centre. In addition, Abbot I-STAT handheld and Roche Reflotron Plus analysers were acquired, exclusively for open-heart surgery, and domiciled in the cardiac centre. Also, dedicated laboratory staff were assigned to the support laboratory. This domiciliation eliminated the need for sample transport from the cardiac centre. Multi-tasking, and associated staff fatigue, were eliminated as a result of staff dedicated to the support laboratory. Abbot I-STAT handheld analyser is a point-of-care device that uses whole blood, thereby eliminating delays caused by sample processing. It also uses improved and innovative technology leading to highly reduced time of test analysis, thus reducing the electrolyte TAT from ~1 hour to ~10 minutes. The domiciliation of Roche Reflotron analyser reduced the liver function test TAT from ~1.5 hours to ~30 minutes. This TAT reduction in the cardiac centre is notable, as TAT for electrolytes and liver function tests remained unchanged in the routine laboratory for routine tests. For this reason, this TAT reduction could be largely attributed to domiciliation and change in study analysers, with other factors like staff change having minimal effect. This domiciliation of the support laboratory in the cardiac centre with associated reduction in TAT is quite significant in a resource-limited setting. It increased surgeons’ satisfaction, since they could have access to laboratory results intra-operatively, with some of the tests done serially. This invariably facilitated rapid onsite intra-operative decision-making by the surgeons, which can translate to beneficial clinical outcomes. These clinical outcomes may be exemplified by the use of blood lactate levels to monitor tissue perfusion status of patients intra-operatively. Increased lactate concentration exerts an acidifying effect on the blood, resulting in acidosis. It has been documented that early-onset hyperlactataemia, which develops in the operating room or very early following intensive care unit (ICU) admission, is strongly associated with adverse outcome in cardiac surgery patients.12 It, thus, becomes pertinent that these conditions be detected and managed immediately for better patient outcome. Having to wait, for instance, one hour for a test that can be done in 10 minutes, before detecting and correcting these conditions may have deleterious effects on the overall patient outcome. In addition, surgical procedures could be done at any time of the day or night, since intra-operative laboratory results could be obtained without delay. This was not the case in the period before domiciliation. Post-operatively too, monitoring of patients could be done without having to transport specimens to the main laboratory. This enhanced prompt decision-making as regards issues around physiological deterioration, patients’ medication and discharge. These measures are equally cost-effective since new staff are not recruited. A few staff are drawn from already employed staff, since many staff are not required. This does not in any way hamper activities in the routine laboratory. Moreover, the benefit of having test results promptly available when needed eliminates the need for repeat testing, which is usually a consequence of delayed test results. Ultimately, prompt clinical decision-making and management usually culminates in shortened hospital stay and reduced hospital costs. The results of this study were obtained from a single centre. There might be a need to conduct a multi-centre study for a broader perspective. This was a descriptive study, hence, no hypothesis could be formulated. Inability to measure direct clinical outcomes resulting from reduced TAT and unavailability of a defined control group were some of the limitations of this study. We were able to demonstrate progressive improvement in performance of the support laboratory using reduction in TAT at different stages of transition from the main laboratory to domiciliation in the cardiac centre. We, therefore, recommend domiciliation of an open-heart support laboratory in cardiac centres where this is not already the case. We are grateful to the management of UNTH, Save-a-heart Nigeria, Voom foundation USA, Cardiostat, and Open Heart Pobic International. 1. Anyanwu CH, Ihenacho HNC, Okoroma EO et al. Initial experience with open-heart surgery in Nigeria. Cardiologie Tropicale, Tropical Cardiology 1982;8:123–7. Future of PAH: what does success look like?